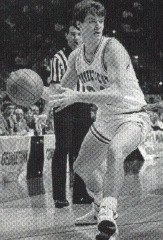 Steve Pikiell was a Guard for the UConn Huskies from 1987 – 1992. After graduation he had the opportunity to be an assistant basketball coach at UConn. Currently he’s an Assistant Coach at George Washington University. I had the pleasure of meeting Steve in December of 2003 when the George Washington basketball team came to Connecticut for a game against Fairfield University. Steve shared some of his experiences as a player and a coach with me. Steve’s first year at UConn was also Coach Calhoun’s first year. It was a time for change for CT. “We were last in the league my first year and I think that was the last losing season. From there, we went through a whole building process. We went from worst to first.” Steve really enjoyed his years at UConn. He learned and experienced a lot to contribute to his coaching career. Steve feels very fortunate that Coach Calhoun hired him on the staff after he graduated as an assistant coach. He loved basketball and he said he probably could have played for another year or two in another country but when given the opportunity to coach, he jumped at it and never looked back. From UConn, Steve took an assistant coaching job at Yale University for three years. After that he was a head coach at Wesleyan, a Division III school in Middletown, CT for a year. Then when Howie Dickenman became the head coach at Central CT State University, Howie hired Steve as an assistant coach. Steve was at Central for four years helping to rebuild the basketball program and was successful—Central got it’s first ever National Collegiate Athletic Association bid. In 2001 former UConn assistant coach Karl Hobbs became the Head Coach at GW and offered Steve an assistant coaching position. Now as an assistant coach at GW, the team is heading in a winning direction. The CT guy that he is, Steve was lucky that much of his basketball career was here in CT. He didn’t have to relocate until joining GW. He’s enjoyed being a player on a team that was being rebuilt and as a coach on teams that are in the rebuilding process. “People don’t realize how big that UConn family is.” He stays in touch with many friends here and many of the coaches that have been a part of the UConn family, he speaks to regularly both personally and when he needs basketball advice. He feels that UConn has grown both men’s and women’s teams to where they are expected to win and he hopes to get to that point at GW. Steve graduated from UConn with a degree in Finance. He met his wife Kate, at the University of CT, also from CT and they have three children, a daughter Brooke who is four, their son, John, is two and a daughter Olivia is nine months old. His wife is a teacher, but currently is a stay-at-home mom. Steve has now been coaching for 11 years. He would like an opportunity at some point in time to run his own program. He’s been a player in a program that became successful and as a coach in several places that became in pretty good shape before he left. He believes that if you do a good job someone will notice at some point in time and you’ll get your chance and when you get your chance you have to be ready. He’s learned from some terrific coaches and they all coach a little differently but the one thing they all have in common is that they’ve all been successful. When asked how the current UConn team has changed from when Steve was there, he said that it used to be kind of a blue collar group of guys, guys that were a little off the radar screen. Now UConn gets great players and Coach Calhoun gets them to play as hard as they can. People really want to play for the University of CT now. Steve’s thought on this team getting to the Final Four are that a lot of it is luck, it depends on the draw in the National Collegiate Athletic Association Tournament, who and where you are playing. They have the talent but you also need luck, no one injured and no one in foul trouble in the wrong game. “They keep knocking on the door of the Final Four and when you keep knocking, it’s going to open. As long as you’re in the hunt you’ll always have a chance.” Steve hopes to be at the Final Four this year and he’d like to take his son. He thinks it would be great to take his son and UConn be one of the teams in the Final Four.